are among the earliest fossil birds to have been described scientifically, lithornithids were first recognized as a distinctive palaeognathous taxon by Houde and Olson (1981) and Houde (1986, 1988). According to Houde (1988), lithornithids include the following eight species: Lithornis vulturinus Owen, 1840 (early Eocene of the London Clay and the Fur Formation), L. plebius Houde, 1988 (early Eocene of the Willwood Formation and possibly the London Clay), L. promiscuus Houde, 1988 (early Eocene Willwood Formation), L. celetius Houde, 1988 [late Paleocene (Tiffanian) of Montana and Wyoming], L. nasi (Harrison, 1984) (early Eocene of the London Clay), ?L. hookeri (Harrison, 1984) (early Eocene of the London Clay), Pseudocrypturus cercanaxius Houde, 1988 (early Eocene of the Green River Formation and the London Clay), and Paracathartes howardae (Harrison, 1979) (early Eocene of the Willwood Formation). Parris and Hope (2002) tentatively assigned a scapula from the latest Cretaceous/ earliest Paleocene of New Jersey to the Lithornithidae, but noted that the similarities shared with lithornithids may be plesiomorphic. The same could be true for an omal extremity of a coracoid from the Paleocene of Walbeck in Germany, which was described as Fissuravis weigelti Mayr, 2007, and tentatively referred to the Lithornithidae (Mayr 2007a). A very well preserved partial skeleton of L. vulturinus from the Danish Fur Formation was described by Leonard et al. (2005; see also Kristoffersen 1999 for further lithornithid remains from this locality). 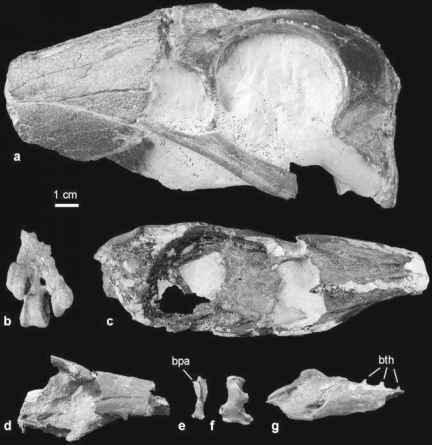 The latest fossil evidence of the group is a postcranial skeleton of an unidentified species from the middle Eocene of Messel (Mayr 2008e). Lithornithid species significantly vary in size, with the turkey-sized P. howardae being about twice as large as P. cercanaxius. In palatal morphology they most closely resemble the Apterygidae. As in other palaeognathous birds, the upper beak bears a pair of distinct furrows rostral to the narial openings, and the ilioschiadic foramina of the pelvis are caudally open, which represents the plesiomorphic condition for Neornithes. Lithornithids had tinamou-like overall limb proportions, a long rhynchokinetic skull, and a well-developed sternal keel. As in extant Tinamidae, the frontoparietal suture remained open in adult birds. Other diagnostic features of the lithornithid skeleton include a long and pointed acromion of the scapula, and the absence of incisions in the caudal margin of the sternum. In contrast to that of tinamous, the distal end of the tibiotarsus lacks a supratendinal bridge, and in contrast to that of all extant palaeognathous birds, the hallux of at least the smaller species was well developed. On the basis of the morphology of the caudal vertebrae, Houde (1988, p. 113) assumed that the tail of lithornithids was short as in extant Tinamidae. Several lithornithid fossils were found in association with eggshells, whose structure resembles that of the Tinamidae both microscopically and macroscopi-cally (Houde 1988; Grellet-Tinner and Dyke 2005). According to Houde (1988), the large accumulations of eggshells in some sites indicate large clutches. Lithornithids may have used their long and narrow beak for probing along shorelines or other bodies of water (Houde 1988). 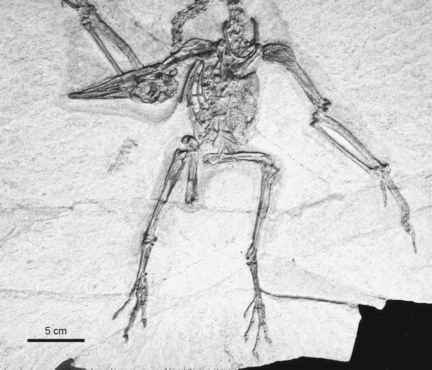 In contrast to extant Tinamidae, they were probably strong flyers capable of sustained flight; the long hallux and curved ungual phalanges indicate perching capabilities (Houde 1988). The interrelationships between the lithornithid taxa and the phylogenetic affinities between lithornithids and other palaeognathous birds are poorly understood and in need of revision. Houde (1988) considered it possible that the taxon Lithornithidae actually is not monophyletic. As noted by him, the large Paracathartes differs from the smaller lithornithids in bone ultrastructure, in which it agrees with extant ratites. Pseudocrypturus is distinguished from all other lithornithid taxa by the absence of a large pterygoid fossa, which the other species share with extant Apterygidae. In discussing the phylogenetic affinities of lithornithids, Houde (1988) assumed a sister group relationship between the Tinamidae and neognathous birds, which is not supported by current analyses (Cracraft et al. 2004; Hackett et al. 2008). The cladogram he regarded as best supported by the morphological data (see Fig. 39 in Houde 1988) shows lithornithids as a nonmonophyletic group, with Pseudocrypturus, Lithornis, and Paracathartes being successive sister taxa of ratites. Lithornithids were considered to be the sister taxon of the Tinamidae by Leonard et al. (2005), who did, however, not detail the character evidence for this hypothesis. Although lithornithids share with extant Tinamidae the presence of an open frontoparietal suture, this feature also occurs in Mesozoic stem group representatives of the Neornithes (Elzanowski and Galton 1991) and seems to be plesiomorphic. An analysis by Dyke (2003a) resulted in a sister group relationship between Lithornis and ratites, but featured several incorrect character codings (e.g., scapula and coracoid of lithornithids are not fused to a scapulocoracoid, and the hallux and supratendinal bridge of the tibiotarsus are not lost in the Apterygidae and Dinornithidae). The analysis of Livezey and Zusi (2007) supported a sister group relationship between lithornithids and all other neornithine birds; the character evidence for this placement was not listed.